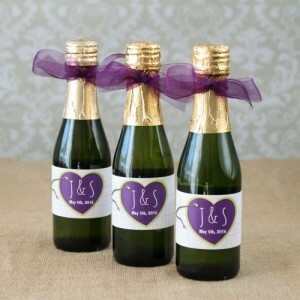 But now, thanks to today’s fun wedding favor you don’t have to celebrate without a little bubbly at your reception! We all know how much I love miniature wedding favors, so when I saw these tiny bottles of sparkling cider I had to share them. Look at how cute they are! And the best part? Since it is sparkling cider it’s completely non-alcoholic so everyone can enjoy this favor! If you want to make these favors extra special you can add a personalized label to the bottles too! You could even add a pretty ribbon to each bottle that compliments your wedding colors. You can find these mini sparkling cider favors here.